Everyone makes mistakes and project managers are no exceptions. With so many things to take care of, a project manager can sometimes get off track and this leaves a huge dent on the project’s progress. Even with a project management software at their disposal, most projects tend to exceed the allocated time and budget and are shelved or abandoned. 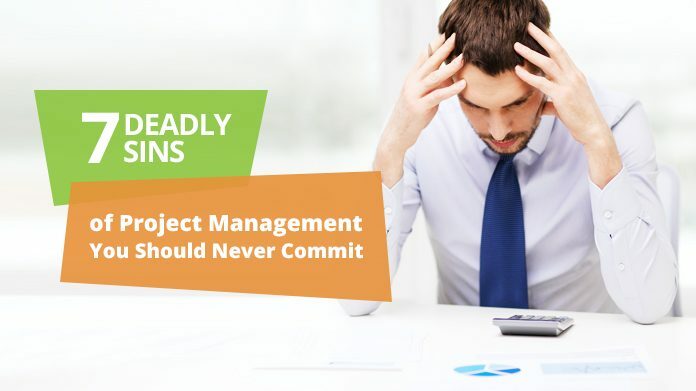 To save projects from failure, here are the 7 deadly sins that top management or project managers should never commit. 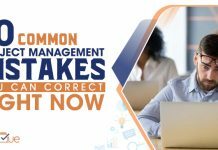 The biggest blunder that can derail your project is selecting the wrong person as your project manager. 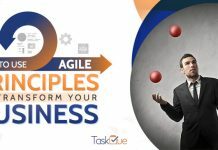 According to American Eagle Group data, around 80% of project managers lack formal training, which is one of the major reasons why 55 % of the projects fails. On the other hand, a Standish Group CHAOS report revealed that project managers equipped with formal training have a success rate of more than 70 percent. This goes to show the importance of trained project managers and how it could increase your chances of completing your projects on time and within the budget. Select a project manager whose experience and skills coincide with your project management requirements. According to Tim Parkin, President of Parkin Web Development, “Communication is the most important factor of successful project management.” His company provides online strategy consultation to help businesses to harness the power of technology and maximize their profitability. Effective communication plays a crucial role in making your project successful by ensuring that all your team members are on the same page. If you want to prevent your project from falling apart, then you must establish a clear communication channel and communicate with your team members on a regular basis. This will help in avoiding any confusions and possibly avoid conflicts and mistakes that could render the project useless. Another common problem faced by project managers is to meet strict deadlines. As a result, they start to reduce the time from different phases. Project planning phase is the most badly affected area in this regard. With no or minimal project planning, the execution of tasks become extremely difficult. Due to lack of proper planning, the project is like a rudderless ship, that can not survive harsh seas. Brian Tracy said, “Every minute you spend in planning saves 10 minutes in execution” Take advantage of project management tools to prepare a solid project plan. It will surely help you in executing the tasks more efficiently and smoothly. Make the project’s scope crystal-clear from the very beginning and prevent making any changes to it during the project, irrespective of how small or large it might be. Even small changes can have a negative impact on the progress of your project. Try to stay inside the project’s scope; otherwise, revising the scope every now and then would push the project in a limbo which will lead to a failure in achieving the objectives that were supposed to be met through the project. Setting an unrealistic deadline and budget for project completion is a recipe for failure. 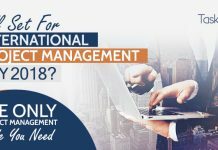 Although, the intentions of project managers are noble when they set tight deadlines but there are times when it acts as a double-edged sword and puts extra pressure on the team working on the project, which could create extra stress among the ranks. Additionally, setting unrealistic expectations will result in missed deadlines, and the greater the frequency of watching deadlines go by the greater will be the level of stress and mistrust within the team working on the project which will contribute towards the project becoming a failure. Therefore, setting unrealistic deadlines can prove to be more damaging than beneficial to the cause. It is better to have a buffer, in terms of times and other resources, for your project to complete it in an effective way instead of setting tight deadlines and unrealistic expectations just to impress your clients/management. In his book “Project Management For You”, author Cesar Abeid interviewed and asked many project managers a question . The question was “Which aspect of project management is most important?” Most of them replied, “Risk Management”. The author was amazed by this response because he was not expecting this reply from so many project management professionals. Identifying the roadblocks that could hamper the project’s progress will go a long way in helping you mitigate those risks. On the other hand, neglecting risk management will lead your project to failure. Follow a proactive approach to risk management and take action at the right time to eliminate any threat beforehand that can hinder project’s progress. With effective risk management, you can execute all the phases of your project smoothly. Whether internal or external clients, their satisfaction level will determine the success and failure of the project. Client satisfaction is a metric to measure success. Keep your clients engaged by conducting regular meetings with them. This way, you can incorporate what your client wants at each stage of the project. This will reduce the frequency of rework and eliminate the expectation gap. Keep all your stakeholders well informed rather than keeping them in the dark about the project’s progress, this means that even if there’s a problem with the project your clients must be informed promptly not only to ensure transparency but also to enable them to change their plans accordingly to reduce the impact the glitch in the project’s progress can have on their business. The core objective of any project manager is to ensure that the project is completed within the allocated time and budget. Meeting the standards and expectations of all the stakeholders is also critical. For that to happen, they should not commit any of the aforementioned cardinal sins of project management. Choose a certified project manager; establish an open communication channel and make the project scope clear. Next, set a realistic deadline and budget on which you can complete the project comfortably. Keep a close eye on all the risk factors, especially those that pose a direct threat to your project. Address these issues before they affect the project progress. Last but not the least; try to achieve the client satisfaction by providing the clients what they want. For that, you will have to use constant communication and incorporation of their feedback.